RCA’s exhibit at the Dayton Hamvention sported a classy white-on-black table cover — or sepulchral, maybe, with the gothic lettering and black skirt. It looks classy to me. And easily adaptable for Halloween with a splash of orange. 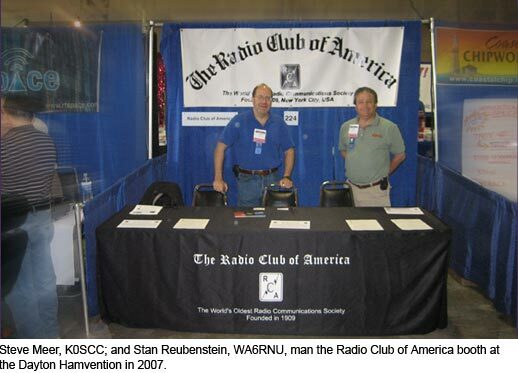 Thanks go to Stan Reubenstein, WA6RNU. He had the new cover made, and he donated it to the Club. Stan, RCA’s executive vice president, said he ordered the new cover for RCA at the same time he was having one made for his manufacturers representative firm, Aurora Marketing Company. Along with Stan, Steve Meer, K0SCC; and Gene McGahey, AL7GQ, handled most of the booth duty. “Robert Walsh, WA8MOA, stopped by and helped for a few hours,” Stan said. Stan said the booth received a lot of visitors. “You need to come next year. We had a blast!” he said. 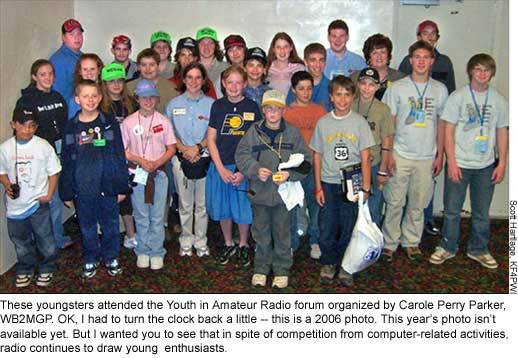 Carole Perry Parker, WB2MGP, spoke at the Teacher’s Workshop and the Youth in Amateur Radio forums. Bill Pasternak, WA6ITF, was the moderator for the Digital Future of Amateur Radio forum. Gordon West, WA6NOA, spoke at the American Red Cross forum and was the moderator for the His Choice forum. Doug Sharp, K2AD, was the moderator and a speaker at the National Frequency Coordinators’ Council (NFCC) Information Session forum. Tim Duffy, K3LR, moderated and spoke at the Antenna Forum, and spoke at the Contest Forum. Dr. Ted Rappaport, N9NB, spoke at the Antenna Forum. Tim Duffy, K3LR, who has organized and moderated the Antenna Forum for 26 years, repeated his role as moderator this year and also presented a paper, “The Design, Construction and Operation of the 28-element OWA 15-meter Stacked Yagi Array at K3LR.” Doubling up on his appearances this year, Tim presented another paper at the Contest Forum, “The K3LR MultiMulti Team.” As the chairman of the 15th Annual Dayton Contest Dinner—now in his 15th year in that role—Tim headed the team that hosted 420 diners at the event that he described as one of his “brainchildren.” A second offspring of that nature is the Contest University, where 150 students and 11 professors participated in 10 hours of intense contesting instruction covering 22 topics and 400 pages of text. The youngest student was nine-year-old W9JJC. Doug Sharp, K2AD, of Firestone, Colorado, was listed as the moderator and a speaker at the National Frequency Coordinators’ Council (NFCC) Information Session forum. He said that the current NFCC president moderated the forum. Doug is the immediate past president. “We had a lively discussion regarding how we attempt to coordinate the new digital modes of communication, specifically repeaters, on the ham bands. Do we just place a new P25 or D-STAR repeater on the same repeater pairs? Or do we try to re-farm the existing repeaters? Try to find new spectrum? It was a discussion such that those coordinators in attendance could start to think about how they will handle this within their groups,” Doug said. He added that in this area, the NFCC only recommends and distributes information. “We are not authorized to make national policy,” he said. Gordon West, WB6NOA, of Costa Mesa, California, spoke at the American Red Cross forum and was the moderator for the His Choice forum, which focused on tropospheric ducting. “The ham radio convention was an upbeat success, probably due to the elimination of the code test, with the word TEST in capital letters. There was no shortage of new hams wanting to learn the code, now that they werent required to take an in-class test. Code is not dead, as evidenced by those selling code oscillators and Vibroplex keys and the FISTs. That is the foundation for the preservation of Morse code in amateur radio,” Gordon said. The Gordon West Radio School had its usual 30-foot booth in the major exhibit area. 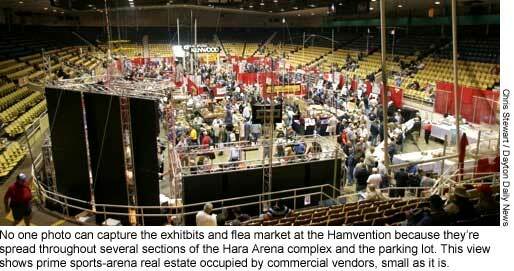 “We offer training materials to obtain the ham license and commercial licenses such as the GROL. Im there to meet the many graduates and encourage them that the most important part of getting licensed for ham radio and getting an upgrade is to get on the air and operate. That was the message I had. Dont get a licensed to have a license; get on the air. Dont think about upgrading to the next level until youve done everything there is on each level,” Gordon said. The His Choice seminar that Gordon presented was about tropospheric ducting. He said the session drew a standing-room-only crowd to hear recordings Gordon made over the years of the radio communications path between Southern California and Hawaii, a distance of about 2500 miles. Gordon said that the path has been worked every July on 2 meters, 432 MHz, 1296 MHz, 2.4 GHz and 5.6 GHz. “This year, were hoping to set the record on 10 GHz between Hawaii and California using tropo ducting, which occurs in July,” he said. “I did several other seminars. One for the American Red Cross, talking about the important pool of volunteer hams, and the value of volunteering for an important agency like the Red Cross that will regularly let them see action. I did some seminars for ARRL on the importance of ham-radio Elmers working with new hams to make sure they get on the air with their new equipment,” Gordon said. I asked Gordon what new hams had to say to him. 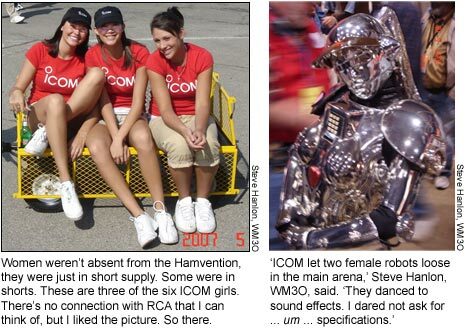 “New hams I met at Dayton were excited about the prospect of being able to operate on worldwide frequencies. In years past, those frequencies were reserved for those who mastered the Morse code. They were delighted to upgrade to General class and get on the worldwide channels without a code test, but they had no fear of learning the code. The only fear was of the test itself, not the code. Now that the test has been eliminated at the FCC level, hams can learn it without the test hanging over their head that kept them from upgrading from Technician to General class. 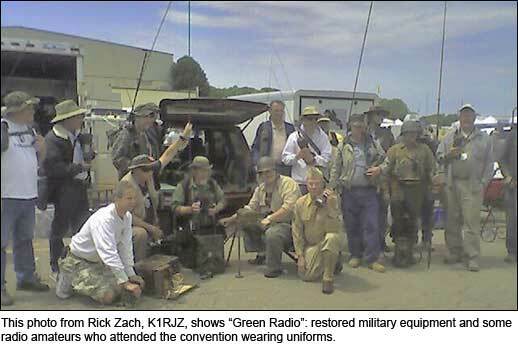 They were positive about their attempt to get on the air and become an active ham radio operator,” Gordon said. I told Gordon that I remembered taking a Morse code test when I was 15 years old. My hand shook because I was nervous, and I couldnt write fast enough to pass the exam as I listened to a test message. “A lot of people think about that,” he said. “They could learn 5 wpm for the Novice or 13 wpm for the General. Its a pressure kind of thing that some people just dont do well under pressure. The code test for 5 wpm lasted five minutes. It would start with zs and ys and ws that were the more difficult letters, and that would unnerve the person taking the test. It was a pressure kind of thing. Im glad that the code test has gone away. We sold more CD products than we ever sold in the past five years, now that the code test has gone away. Were delighted for the hams that feel that code is important, as I do, that no longer do they have to sit for a pressure-cooker exam,” Gordon said. RCA has few radio amateurs among its elected leaders, yet as much as 60 percent of the members have amateur radio licenses. It occurred to me that it could be a fine thing for some of RCAs leaders to obtain licenses as a way of recognizing and honoring the heritage and tradition of the Club, along with setting a good example for younger members who join. I mentioned that to Gordon. “Any time that RCA wants to hold a one-day refresher course for some of our members to license up as an entry-level ham operator, let me know, and Id be happy to offer it, including coming to New York City in November for a day before the big meeting,” he said. “Many RCA personnel certainly are technical enough. One has to be brought up to date on rules and regulations of the Amateur Service that they may not have had contact with, and some of the modes of communication that ham operators use. Without the code test, we could do a one-day class and get members up to the entry Technician level,” Gordon said. This entry was posted on Wednesday, June 6th, 2007 at 7:32 pm and is filed under RCA news. You can follow any responses to this entry through the RSS 2.0 feed. You can leave a response, or trackback from your own site.